Parking: Pay and display car park in Horton in Ribblesdale (grid reference SD 807 726) - small amount of road side and layby parking available, but please park responsibly as Horton does get busy, especially at weekends and bank holidays. Turn right out of the car park and follow the road past the Tourist Information Centre and the Post Office. The road bends round to the left at the Golden Lion Hotel and straight away round the bend there are two side roads. Turn down the second road that has a school sign at its junction. From this junction, you get the first real view of what lies ahead. Pen-y-ghent lies imposingly straight ahead. Carrying on up the lane past the primary school, the lane slowly gains height and bends round to the right as it approaches Brackenbottom Farm. 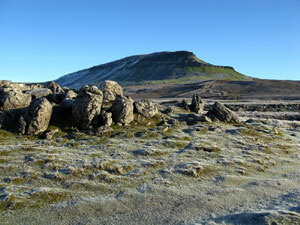 Immediately before the farm, turn left at the wooden signpost claiming "Pen-y-ghent Summit 1¾ miles" through a wooden gate. Thirty yards further on, climb the stile and immediately turn left following a very well trodden footpath up the side of the wall. Remember though that the early months of the year are lambing times and dogs must be kept under very close control preferably on a lead. Sheep and lambs are very evident in the fields in the early parts of the climb. Whilst progressing up the first field, even though Pen-y-ghent may disappear from view, the more height gained affords a splendid panoramic view behind of Horton, Ingleborough and Whernside. Continue on up the hill closely following the wall until you meet a second wall that intersects the first at right angles. Climb over the stile built into the wall and continue onwards in the same direction following the undulating path which is slowly gaining height. Continue over the next stile built into another intersecting wall and again carry on in the same direction heading for the right-hand corner of Pen-y-ghent. From here the whole of Pen-y-ghent comes into view. Continuing over a wooden stile, the path bends a little to the left before returning to its original line again following the wall. Shortly after the next double stile is passed, a man-made flight of stairs is climbed to reach the stile where the Pennine Way is joined. Turning left over this stile, the climb now really starts in earnest. Whilst the path upwards may not be clearly visible from this stile, by progressing further up, the path unfolds. The path now rises very steeply and becomes less distinct, with the most distinct one skirting the grassy edge and coming back round a little to the left to pass in front of a large almost vertical crag. Keeping straight ahead (a little scrambling may be necessary) the path briefly flattens before another very steep and rocky climb marked by cairns. Towards the top of this a little scrambling may again be necessary, before the path gradient flattens dramatically and returns to being very well defined. The path runs almost parallel twenty yards to the right of a wall and slowly rises for the final few minutes walk until the trig point is reached. Over the wooden stile a few metres from the trig point, a sign points in the three main directions down from the top (Dale Head, Horton and Foxup) with the Horton path the one to follow (walking away from the wall). The path snakes downwards and then turns to the right to follow the edge of a steep cliff. Down to the left the path home can be clearly seen with Hunt and Hull Pots also visible. The path continues downwards following the edge of the cliff until the sign is reached where the path takes a sharp left. The path straight on here is one of the Three Peaks routes (see separate walk). Follow the path around and down to the left. Continue on down this well defined path and over the stile on the wall. After about fifty metres a little detour can be made. Twenty metres off the path to the left lies Hunt Pot where a stream disappears into a hollow in the ground. Do not get too close though as the hollow is a two hundred foot vertical shaft. Returning to the main path, negotiate the next double stile and a few yards further on a path comes in from the right, whilst the way home is down Horton Scar Lane to the left. Before entering the lane, a very impressive detour can be undertaken by walking for about five hundred metres in the opposite direction following the Foxup sign. If it is misty it is advisable to stick closely to the wall on the right as Hull Pot is a huge, steep sided crater nearly one hundred metres long and fifteen metres deep. The crater is a very impressive sight after heavy rain, when waterfalls are formed over its side. Return back to the lane entrance and go through the gate in the direction of the signpost "BW Horton in R 1¼". Proceed down the walled lane, and straight on through a gate. As the houses of Horton come into view where the lane bends sharp left, the car park is visible straight ahead. Continue until a junction is reached, follow the right-hand fork down to the main road. Turn right and follow the road for the final few yards back around to the car park.